Does anyone care about the summer of football? Will the ‘Summer Football Festival’ be a success? Who knows? But the fact is that preaching to the converted isn’t working, and nor is arrogantly dismissing what football can learn from other sports. My fiancée Ashton Rigg is the Content and Social Media Manager at Youfoodz, and thanks to her I watched last night’s clash between Brisbane Roar and Perth Glory from a corporate box. It was nice to watch a game while sipping on some free beers and enjoying Suncorp Stadium’s hospitality, and the young lady bringing us our snacks couldn’t possibly have been any nicer. As for the game itself… who cares? Well, the Aloisi brothers for one. They’ve had a couple of run-ins with supporters at the end of the past few games. And the 7,000 fans in attendance cared – or at least a portion of them did. The rest just sat around looking dazed and confused and no doubt unimpressed with the sterile atmosphere. Not many on Twitter seemed to care. I saw a few tweets about the game, but mostly it was silent. And Fox Sports cared. Enough to produce the same high-quality broadcast they do for every A-League game, at any rate. Anyone else? Mainstream Australia couldn’t have cared less. They were all watching the Big Bash League. And this mysterious grassroots base of ours – the lazy million or so social players who call themselves football fans despite never setting foot inside an A-League ground – they don’t care. Because if they did, they would surely sense that the A-League is in a spot of bother and pitch in to help out. But you can’t talk sense into people. I should know. The second I point out that Brisbane Roar attracted 7,000 fans to Suncorp Stadium for an A-League game just a night after Brisbane Heat drew 27,000 fans to the Gabba for a Big Bash League one, is the second someone in the comments section writes: “apples and oranges” or “look at the size of their broadcast deal” or “it’s just mindless entertainment”. It sure is. So what exactly is the A-League? Is it also just entertainment? Or is it a sport that demands more respect, one we should put on a pedestal because of its long and proud history? Because if it’s the latter, then where are the fans? 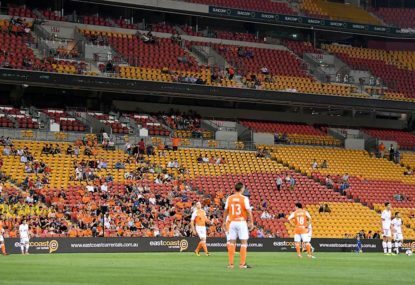 Not the 7,000 in attendance at Suncorp Stadium – who deserve to be commended – but the rest of them? How come we can’t get crowds like Bristol City did at Ashton Gate when they knocked Manchester United out of the League Cup in those unforgettable scenes? 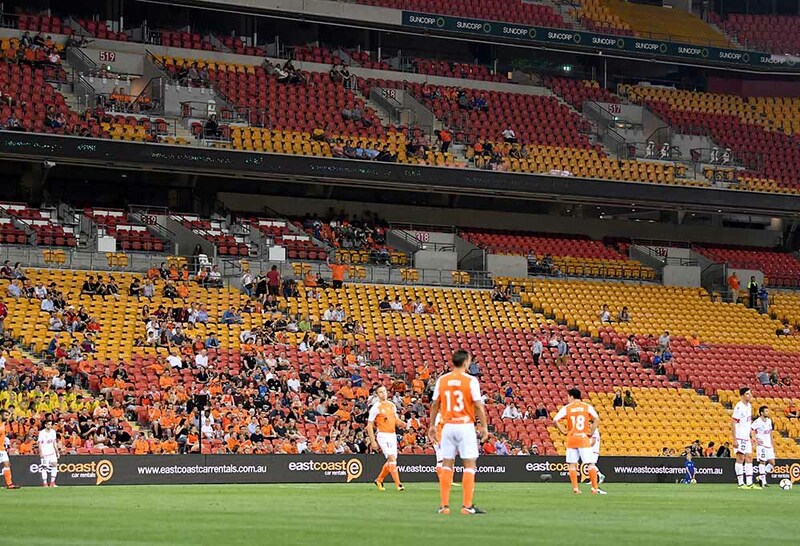 Is it Football Federation Australia’s fault that the same number of fans aren’t coming to A-League games? Or Fox Sports’? Is it my fault? If we were to release a soundtrack for the Summer of Football, surely an apt name for it would be ‘Apathy for Destruction’. Because going through the motions and doing the same things we’ve always done is yielding the A-League increasingly diminishing returns. Yet pointing this out will bring me nothing but grief from readers of a free website who demand to know why The Roar didn’t run the same match report they can read elsewhere; who criticise Fox Sports’ coverage despite many refusing to pay for it; who insist I offer some solutions when no one else in the game seems able to. The truth is that I don’t have any more answers beyond the obvious – ticket prices, marketing, scheduling, connecting to the grassroots. But what I do know is that I bought my fiancée a season ticket at the start of the campaign, and increasingly I’m struggling to justify why she should bother to use it. The A-League today is not where I thought it would be. And that’s a problem for the executives who get paid big bucks to solve. Otherwise the only people who care about the next marketing campaign will be the same faceless suits who came up with it.